KEYSTONE CROSSROADS — Pennsylvania leaders are teaming up in an effort to reduce the number of people with mental illness in county jails across the commonwealth. The Commission on Crime and Delinquency and the Council of State Governments Justice Center are launching a statewide center — the Stepping Up Technical Assistance Center — to provide counties with support and resources to help collect data and track how well people with mental illnesses are receiving the treatment they need. 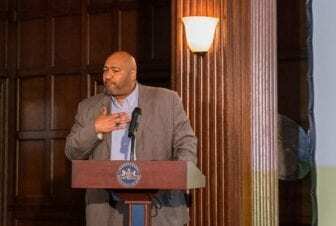 The center is a step toward solving a problem that has long plagued the criminal justice system, said John Wetzel, secretary of Pennsylvania’s Department of Corrections. Dr. Rachel Levine, secretary of the Department of Health, said the state needs to adopt a public health approach when it comes to tackling the problem of prisoners with mental illness. Mental health conditions — such as mood disorders, depression, bipolar disorder, anxiety disorders and addiction — are medical conditions that must be treated with the appropriate model, she said. “I think that the technical assistance center will allow us to determine the ways in which you can further help individuals struggling with mental health issues and share important information across the state,” Levine said. In Pennsylvania, 29 of 67 counties have made a commitment to reduce prison populations with mental illness. But to make that commitment a reality, counties need some basic support and resources — starting with appraising the problem’s scope, said Megan Quattlebaum, director of the Council of State Governments Justice Center. “How do you define serious mental illness? Do you have an accurate count of the number of people currently in your jails with mental illnesses? What type of mental health assessment do you have, if any, in the jail to identify those people?” she said. That’s where the Stepping Up Technical Assistance Center comes in — to help counties collect data on those key questions. The new center will also use in-person and distance-based training to improve mental health screenings and assessment and establish a baseline of performance measures to track progress, said Derin Myers, acting executive director of the Pennsylvania Commission on Crime and Delinquency. “Information that’s collected by the counties will highlight the extent of this issue in the commonwealth as well as the most pressing individual needs, the challenges the counties are facing, and the progress they are making,” Myers said. He added that the information collected by the counties might advise future statewide initiatives such as diverting people with mental illnesses from arrest and jail bookings as well as other potential approaches to reduce recidivism.